Zoiks! She’s a Master of Disguise | Handful of Health | Health, Fitness and Happiness, one handful at a time. Sometimes I feel like a Scooby Doo villain. 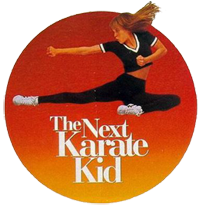 At some critical point during this black belt test, my talented fellow testers will unmask this personae of “CGN Elaine” to reveal the sinister, lazy, asthmatic two-timer trying to pass herself off as a black belt and martial artist. Other days, I might feel decent about my ability to throw a kick without falling over, or not get tapped out in 10 seconds by a white belt, or sprint a pretty good 400m — but then I see my fellow testers kick higher, punch harder, feed flawlessly, throw great sparring combos, break personal record after personal record… the list is endless, because holy cats, this year’s testers are incredible! What am I doing here? This is something that I see a lot of the adult candidates struggling with this year. Mindfulness meditation over the past year has at least helped me discover the source many of these doubts within myself, but the thoughts still come and go. Some of us are very self-aware of our doubt, and of our tendencies towards self criticism or perfectionism. Some of us already know that “Comparison is the death of joy” (Mark Twain). Some of us may have even experienced impostor syndrome in other aspects of our lives — are high-achieving individuals marked by an inability to internalize their accomplishments. Have you ever stepped back and really appreciated what you’ve accomplished in your martial arts journey? Do you remember how it felt to watch the brown and red belts test when you were a gold or green belt? Do you remember the first time a non-instructor black belt fed you boxing combos at Saturday morning thai boxing? Do you realize how close you are to being that black belt for someone else? I want every single one of you to know that we all deserve to be here. I am infinitely glad to have each and every person in this test as my teammates. Thank you for being part of my test… especially when I’m having a hard time really accepting it as my test. Bonus content: Every Scooby Do villain revealed in under four minutes! This entry was posted in Happiness, Martial Arts and tagged black belt journal, mastery2017, mental health, teamwork. Bookmark the permalink. You’ve put a lot of time and effort into martial arts. It’s kept you fit and mentally healthy. Just keep going and see where it takes you!